The Grand-Duchy of Luxembourg is one of Europe’s best kept secrets! The country’s beautiful capital city combines modernity with ancient European architecture and features an impressive amount of unique landmarks. Furthermore, the countryside of the Grand-Duchy is a playground waiting to be explored, with many impressive castles as well as quaint little towns and enchanting forests. Here are 25 unique pictures to showcase the country’s inherent beauty. They have all been made by local fine art photographer Christophe Van Biesen. This is one of Luxembourg City’s most popular views, which is easily accessible from the city centre. You can see this epic view for yourself from place de la constitution in Luxembourg City, where you’ll also find the Gëlle Fra, Luxembourg’s Golden Lady. Luxembourg knows how to celebrate its National Day. 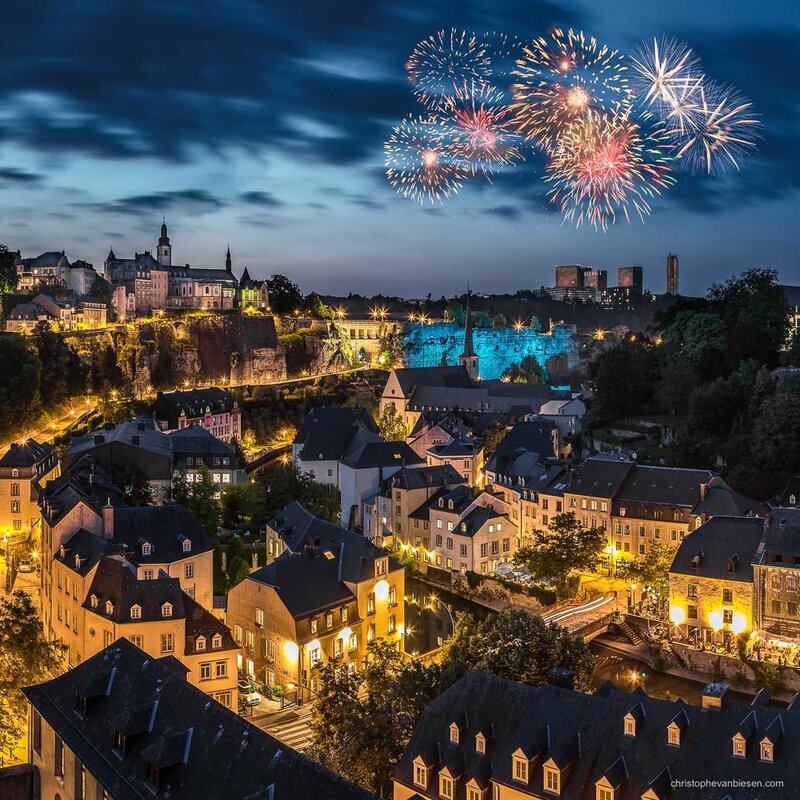 Every year on the eve of the 23rd June, Luxembourg’s shows an impressive fireworks display and the city then celebrates until the early morning hours. The 23rd June, which marks the Grand-Duke’s birthday, is then celebrated throughout the country. 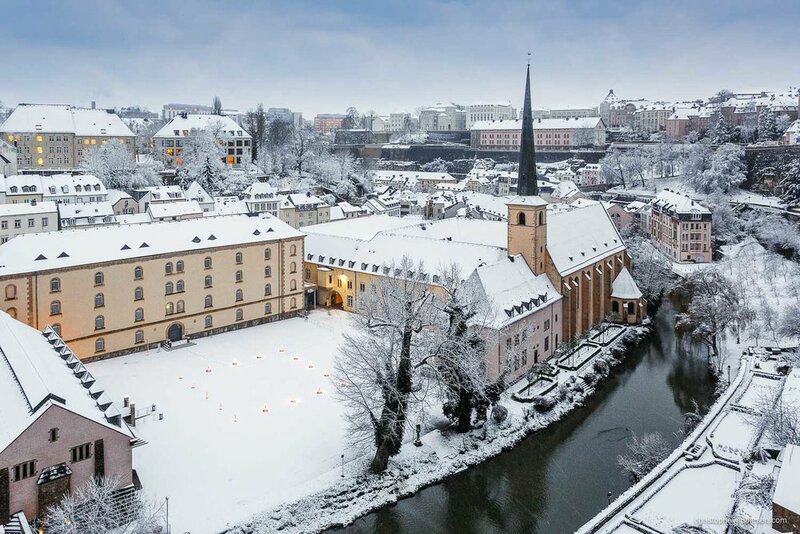 The picturesque Grund neighbourhood with its Abbey of Neumunster is another very popular view over Luxembourg City. It looks even more impressive on a winter morning with lots of snow. While Luxembourg won’t rival the cherry blossoms of Japan, there a few nice places in the city that bloom every year. This particular tree which puts up an impressive show during spring can be found near the judiciary palace on the Holy Ghost Plateau. Luxembourg isn’t called the Green Heart of Europe for no reason. The capital city features some impressive forest in the Petrusse and Pfaffenthal valleys. Every autumn those valleys turn into a spectacle of colours. Luxembourg’s Grand Duchess Charlotte Bridge connects the city’s centre with the European neighbourhood on the Kirchberg plateau. Called the Red Bridge by the locals, this steel giant is one of the city’s modern marvels of architecture. Nightime in Luxembourg-City's Grund with the Abbey of Neumunster and the Saint Michael Church, seen from Jacob Tower. Place de l’Europe on Luxembourg’s Kirchberg plateau hosts the towers of the European Parliament and the European Justice Court. It is quickly becoming one of the most modern areas in Luxembourg City. The abbey of Neumunster was Luxembourg City’s old prison. Today it’s a cultural centre which hosts many concerts during summer. The Avenue de la Liberté connects Luxembourg City’s centre with the central railway station. At night, the avenue lights up with the numerous cars that drive through here. 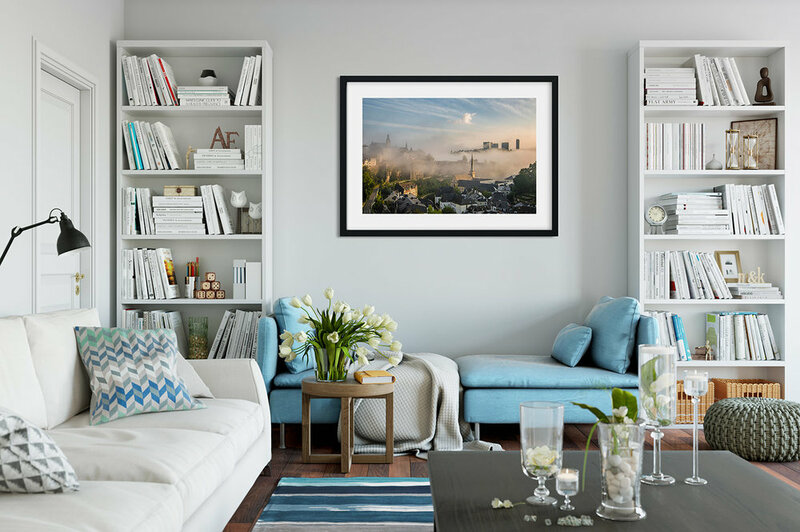 Are you interested in acquiring a limited edition fine art print of one of the pictures shown in this gallery? 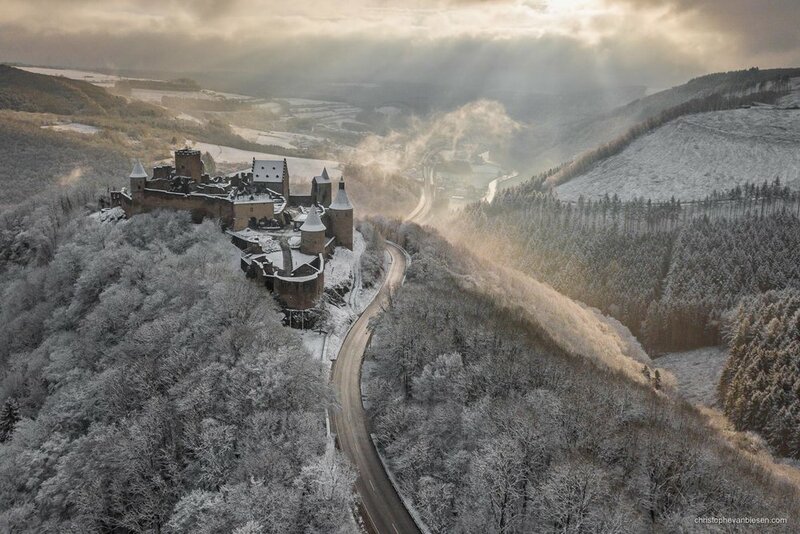 The view over the castle of Bourscheid in the north of the Grand-Duchy of Luxembourg on a cold winter morning is impressive, even more so from the air. Sunrise in Luxembourg City on a late summer morning with fog rising from the forests of the Pfaffenthal and slowly making its way into the Grund neighbourhood. 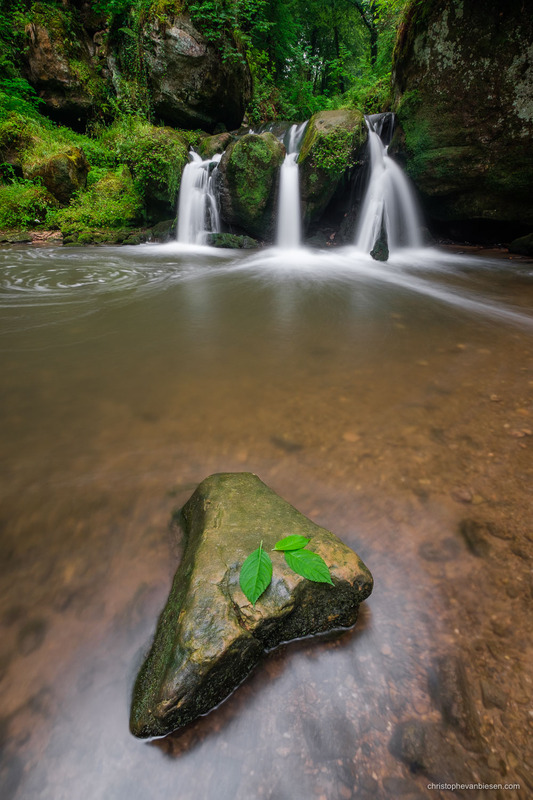 Luxembourg's Schiessentumpel waterfall in the Mullerthal region on a rainy summer day. 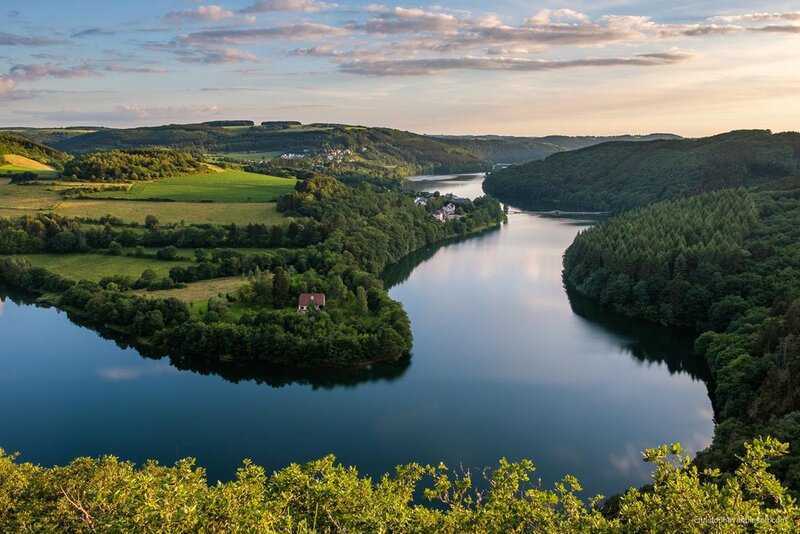 The Upper-Sûre Lake is Luxembourg’s largest body of water and provides most of the country’s fresh water supply. It’s located in the northwestern part of the Grand-Duchy and is also a great location for recreational bathing and hiking. 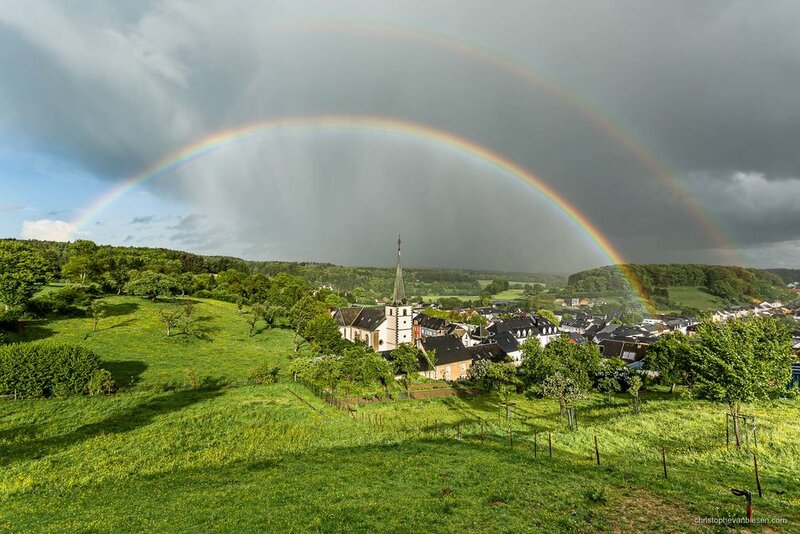 Luxembourg can be very rainy, but as the saying goes: after the rain comes sunshine, and sometimes rain and sunshine combine to create the perfect rainbow. The castle of Beaufort lies in the northeastern part of Luxembourg. While it might not be as well known as the castles of Vianden or Bourscheid, it offers some unique views from a small lake that lies right beside it. Sometimes Luxembourg gets hit by intense periods of frost. This is the best time to wander in the forests or along the valley’s of the capital. Here the entire Petrusse valley is frozen while the Banque et Caisse d’Epargne de l’Etat ressembles a lone castle tower above a fairytale forest. The riverside of the Alzette river in Luxembourg City's Grund is particularly beautiful on a winter morning with much fog and mist. 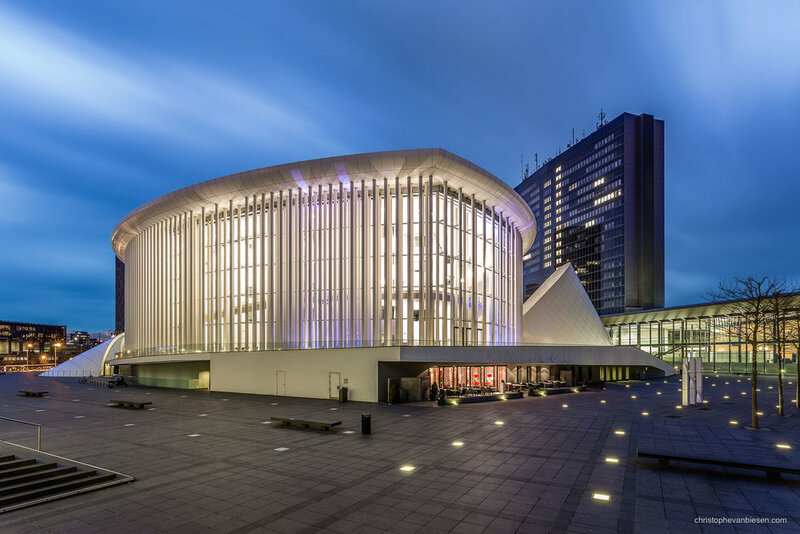 The Philharmonie is one of Luxembourg City’s most beautiful modern buildings. It stands between the skyscrapers of the European Union on the Kirchberg plateau and hosts a myriad of concerts all year round. 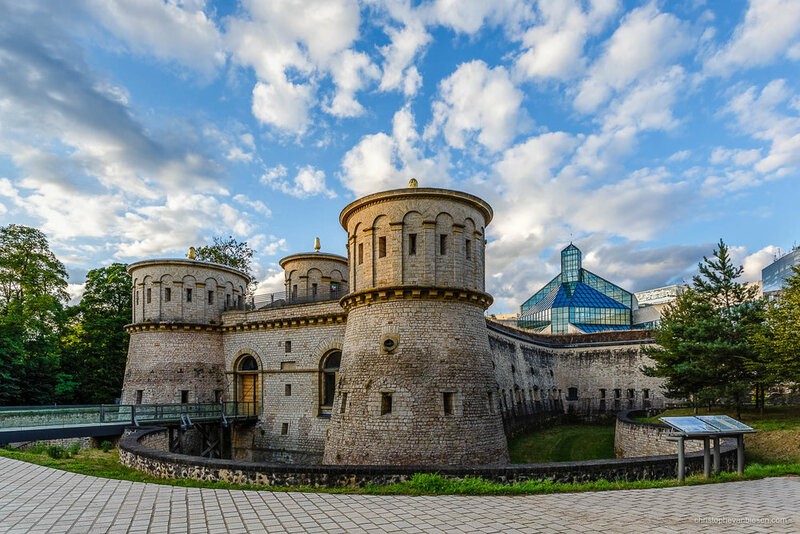 On the edge of the Kirchberg plateau you’ll find Luxembourg City’s museum of modern art, called the Mudam, as well as the impressive three towers of the Fort Thüngen which also harbor another museum. The skyline of Luxembourg City features many interesting landmarks such as the BCEE tower and the roofs of the Notre-Dame Cathedral. You can see this particular view yourself from the bar at the top of the Sofitel Grand-Ducal Hotel. 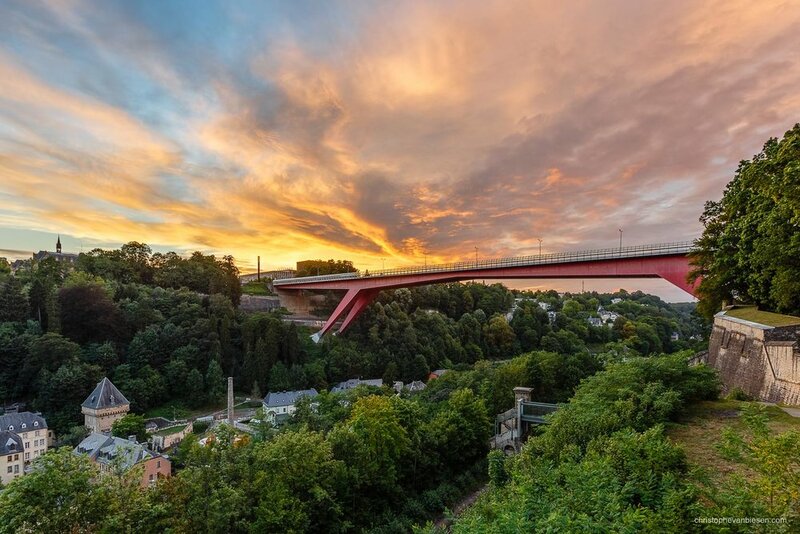 The Old Bridge traverses Luxembourg City's Pfaffenthal as well as the Grund neighbourhood all the way to the central railway station. Every year in April the small village of Lellingen which lies in the far north of the Grand-Duchy of Luxembourg is witness to a spectacle of yellow flowers that spread all over the forest. Luxembourg City features many different old towers all over the ancient fortress. These are the Three Towers and one of the Spanish Towers. Luxembourg City’s Christmas market is a true festival of lights and takes place on Place de la Constitution, Place d’Armes and Place Guillaume II. Every single picture in this gallery is part of the Luxembourg Art Collection by fine art photographer Christophe Van Biesen and can be acquired as a limited edition fine art print. To see even more pictures made in Luxembourg visit the Gallery.